We all know that maintaining the body fitness is already a challenge that requires hours of work out and focus, but when you are equipped wrongly, the task gets more complicated. Unfortunately, picking the right exercise types of equipment has never been an easy task. When you are buying a good Mini exercise bike, you are likely to come across myriads of bikes. Seeing their different specification, prices, usability, and features will only cause confusion and people often complain about purchasing the wrong exercise bikes in the first shot. We don’t want to let that happen to you, and that is why we are here with a complete list of specifications, plus top 5 mini bikes available in the market. Some people buy exercise bikes with less cushioning and then try to make it adequate with gel covers. But, we want to warn you that it’s one of the wrongest approaches. Better buy a mini scooter with enough cushioning than getting into trouble with it later. If you are into intense exercise, we would also recommend you to look for an adequate size of the seat as the smaller ones are always meant for small and steady workouts. Most of the bikes have normal pedal, but you should check for it diligently as getting tiny pedal is likely to ruin your workout hours. Plus, it is always so complicated when it comes to the returning of products. You can also look for bikes that come with additional clips. Exercise bikes use a number of methods to boost the resistance levels in the pedals. A bike with good resistance will make sure you spend good strength and ability in the beginning. You basically need to look for resistance that can be adjusted as you might want to start with a lower resistance and then make the way to higher resistance. 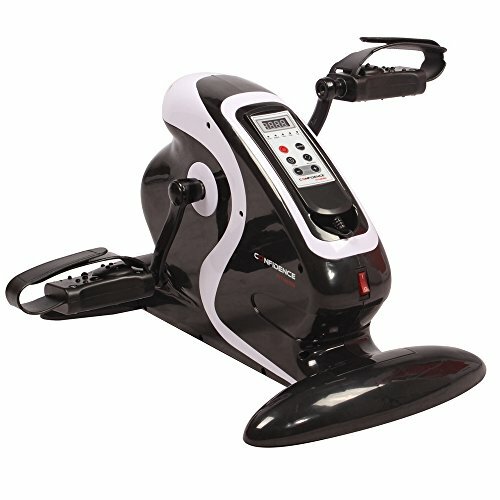 Some manufacturers try to keep the bind with your routine by giving excellent accessories with the mini exercise bike. You can expect a drink holder, USB charger, health accessories, mobile holders, fan, wireless compatibility with fan, and body fat measurement. Built and design: MagneTrainer-ER Mini Exercise Bike Arm and Leg Exerciser is one of the sturdiest choices that you can look for. It is likely to last for years and we like its sturdy components. You will see 4V belts, German flywheel bearing, heavy duty pulleys, and flywheels. The 15-inch steel base is likely to control the unnecessary rocking of the bikes and in order to accommodate all foot sizes, its pedals are fitted with Velcro straps. As far as portability is concerned, it is so portable that you can place it right below your table and exercise while checking your mail or checking your phone. Performance: If you are looking for a wide resistance range and smooth pedals, then here you have one great choice on your list. Unlike the other bikes, the resistance of this bike is not limited to 8 levels. The 5-rotation level will make sure; you precisely select the resistance you want. We consider it good for those who spend a lot of time in sitting jobs, as they allow you to keep up with the metabolism of the body while working regularly. For a comfortable use of the bike under the desk, you will need a disk size of approximately 34 to 36 inches. However, if you want to keep the distance a bit more, then a 33-inch one will work. The mini bike is fitted with an LCD display that will display your speed, distance, time and calories. It will store all the data until you reset it and when you stop using the bike, the display will automatically stop working. The product also comes with a 1-year warranty for all its parts including labor and shipping. It weighs 24 pounds, which is slightly high. Built and Design: Sunny Health & Fitness SF-B0418 Magnetic Mini Exercise Bike is a compact and light weighted mini bike that serves the indoor purpose of exercising. Even the handles of this mini bike support portability so that you can carry it anywhere without allocating much space to it. Nonslip large pedals are attached to this mini bike so as to offer the finest grip to varying sizes of the foot. The pedals are also fitted with good quality strips so as to avoid slipping of the feet. As for the weight of the feet is concerned, it weighs not more than 24lbs, which is good from the point of compatibility. Plus, this weight is good enough to keep the bike in place while exercising. To avoid slipping, the bottoms of the machines are fitted with rubber. Performance: The mini bike comes with 8 levels of resistance which is good enough to make you sweat. To make the functioning better the pedals are made to work in both the direction, forward and reverse. This is likely to focus on different types of muscles. Plus, it is going to be better because the pedal works equally well with both hands and feet. You can read all the measurements via the LCD attached to the machine. We won’t say it is easy and clear to read from this LCD, but it gives you an idea of calorie burnt, Speed of pedaling, LCD, ODM, and other body data. Given it is available at such a low price; you have enough perks with this mini exercise bike. The pedals work for hands as well as legs. Scan mode shows the display functions. Nonslip large pedals with the finest grip. Built and Design: Exerpeutic 7101 Active Cycle Mini Exercise Bike is everything that you need to add in your daily routine if you desire to stay fit while keeping up with your hectic routine. The best part is you can take this mini machine with you anywhere you want and engage in the foot as well as hand exercises. People who buy it usually use it while working on the computer, watching TV, and reading books. You can simply place it on your table while working on your laptop. The foot pedal comes with adjustable straps to keep your feet in place and it also comes with a skid floor and desk mat, which controls the slipping of the feet. For an easy relocation, it also comes with carrying handles. Performance: When it comes to performance, Exerpeutic 7101 Active Cycle Mini Exercise Bike is one of the best performing mini exercise bikes in the market. Active Cycle is the motor drive, but you can always use it without Motor for better resistance. With adjustable speed and overload protection feature, this mini cycle works better than any of the existing ones. It is a good workout bike that is meant to improve your balance, strengthens muscles, and promotes blood circulation. At below $100, this one is most practical and versatile option you can have. We also like its LCD display feature that shows the distance, speed, time, and calories. It works at a standard 120 V and the power consumption here is approximately 6.5 W. It is best preferred by people who have difficulty in leg movements. Built and Design: If you are looking for mini bikes with minimum height, then here is the perfect choice for you. 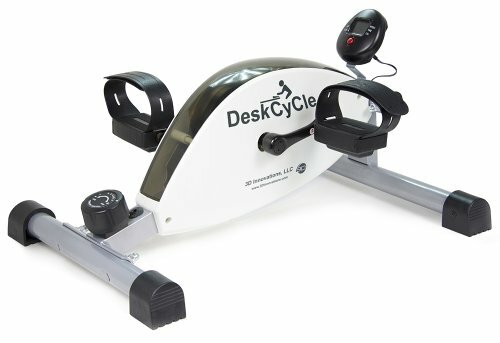 This DeskCycle Desk Exercise Bike Pedal Exerciser, White works best for you. We are amazed to see how well it works with just 27 inches desk. With a pedal arm of length 3 ½ inches, it works fine for all sizes of feet. The pedals can be used with Velcro straps so as to make feet sit properly on it. For the best use, you will need a low base chair. Performance: As far the performance is concerned; the mini bike comes with a good resistance that is good for moderate exercise. The pedal motion is bidirectional so that you can move it forward and backward, making it easier for you to engage all your body muscles. With smooth and flawless mechanism, this mini bike starts functioning without bothering the people around you. Other bikes can be noisy, but this one is perfect when you are working in a surrounding where you don’t want to be the only source of a noise. Above everything, we like its glossy white color. Eventually, this is one of the best deals that you can look forward to under $200. Built and design: This one is an extremely light weighted mini bike that users prefer for its portability. You can place it anywhere according to your use and use it for routine paddling. The built-up is sturdy and it is likely to be there for ages. You get to choose from two color options, white and black. For us, both colors worked fine as this tiny bike is meant with aesthetics in mind. 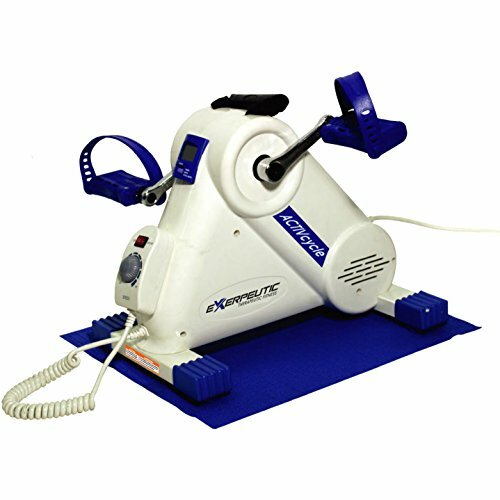 Performance: This mini exercise bike offers low impact resistance, which is good enough for low impact exercises. You can relax in front of the TV while doing your little body movements. The adjustable speed you pick is in total 12 numbers. You can pick up the pace slowly, which will improve the blood circulation and strengthen the body muscles. The bike does come with motor assistance, but you don’t actually need it, you can simply switch it off. 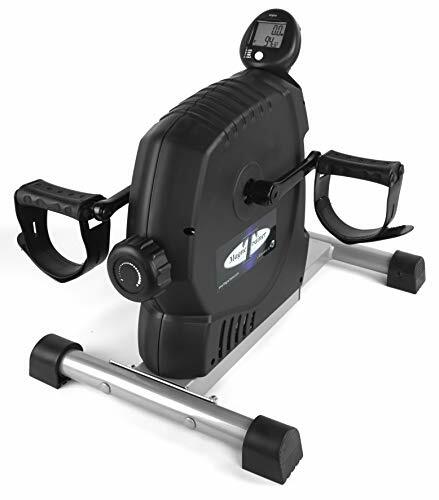 Confidence Fitness Motorized Electric Mini Exercise Bike / Pedal Exerciser is one of the products that you can use for both hands and legs. The built-in LCD in there will show you the speed, burnt calorie, and other health details. This LED can work through remote controls. It has 5 built-in automatic programs that work well with most of the users. Pick any bike from this list, and it will work wonderfully for you. All these mini exercise bikes have more than five rating and are robust in functioning. Given that these are the most affordable option, we put them on our list. So, gear up to maintain your fitness level. Let us know if we have missed any of the worthy ones on our list.